Looking to update Moto Z Play to Android Oreo? This guide is for you. Motorola has been conducting Android Oreo Soak test for Moto Z Play for a while now. In this guide, we will tell you how to install Android Oreo on Moto Z Play manually (via Moto Z Play Oreo OTA zip), without having to wait for the OTA update! Moto Z Play is a solid midranger launched by Motorola in August 2017. For a device which is this old, it is good to see Motorola putting in some effort in bringing Android Oreo for Moto Z Play. While some manufacturers like OnePlus are relatively fast in bringing the Oreo Update to their device, some are really lagging. For example, big shots like Samsung are still struggling to bring the latest Android update to their flagship devices. Read ahead to know more and Download Moto Z Play Oreo Update. Motorola began Android Oreo Soak test for Moto Z Play sometime around the mid of January. A few devices will first receive the Android Oreo update for Moto Z Play. The full-blown roll-out might take some time. Usually, the final roll-out happens more or less in a months time from when the soak tests begin. You can check for the update by going to Settings > About > System Update. 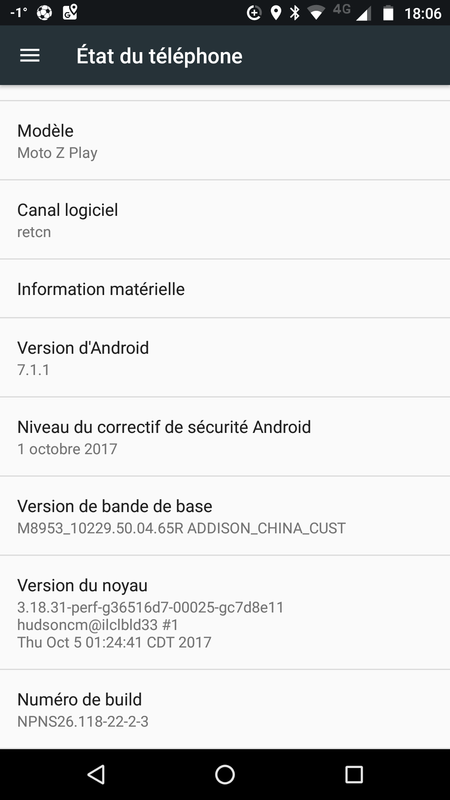 But, if you do not want to wait for a few days for the OTA to reach, you can manually update Moto Z Play to Android Oreo right now. Make sure your device is running the software build NPNS26.118-22-2-12. Make sure that you have at least 60% of charge before proceeding. There are two methods by which you can update Moto Z Play to Android Oreo. Choose whichever one you feel comfortable with. Both work just fine. Enable USB Debugging on your Moto Z Play: Go to Settings > Developer options > Enable USB Debugging. Copy or move the downloaded Oreo Update Zip file to the folder where ADB and Fastboot are installed. Press and hold the Volume Down + Power button together until the device turns on. Press the Volume Down button to highlight Recovery mode. Press the Power button to reboot into Recovery mode. You’ll see a dead Android robot with a red exclamation mark. While holding down the Power button, press the Volume Up button. Once you are in recovery mode, use the volume buttons to highlight Apply update from ADB and use the Power Button to select it. Connect your phone to PC/Mac via USB cable. Open a command prompt from inside the folder where ADB is installed. Windows: Hold down Shift Key + Right Click > Select ‘Open command window here’ or ‘Open PowerShell window here’. If your device is listed, head to the next steps. Copy the Moto Z Play Oreo Update Zip file to your device. Once you are in recovery mode, use the volume buttons to highlight Apply update from sdcard and use the Power Button to select it. Select the Oreo Update Zip file which you downloaded to install Moto Z Play Oreo Update. Android Oreo comes with a lot of exciting new features and a lot of improvements. Play around with the newest, sweetest version of Android yet. These are the easiest methods to install Moto Z Play Oreo Update. What’s your current version? Can you post a screenshot?